SKU: 8907043162073 Stock: Not Available Category: Bronze. 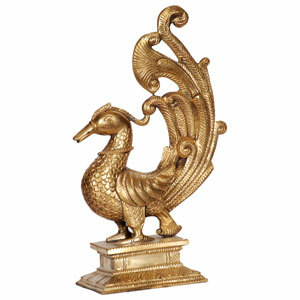 Bronze Peacock With Base.Bronze casting in Karnataka dates back to several centuries when craftsmen meticulously sculpted idols of gods and goddesses. Craftsmen work on the metal to create bronze statuettes, each of which is a masterpiece. Using their deft fingers and skilled hands, craftsmen cast the solid or hollow metal by the lost wax process, pouring their imagination into the mould. After casting, intricate designs are worked on the metal, to give life to their creations. The captivating eyes of idols reflect calmness and their gleaming surfaces take you back to the era of myths and legends. The elegant and exquisite ornaments finely sculpted on the idols depict the style of the Chalukyas and the Hoysalas.